Let me introduce you to Carlisle's Cateraide IT insulated transport containers, the only transport product to give you beauty and durability in one sweet package. 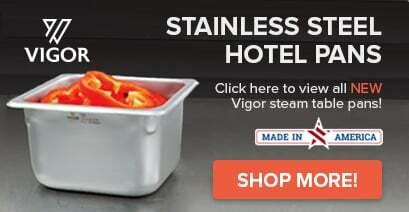 It has a sleek, contemporary design that's perfect for elegant buffets and outdoor parties, and they're durable enough to handle daily transports. The Cateraide IT line includes a 2.5, 5, and 10 gallon beverage server; 4", 6", and 8" top loaders; and 6" pan loader with optional dolly. Cateraides are available in onyx, caramel, and olive. If you're wondering why this front-end loader has a nice, polished look, it is because all Cateraides receive a special coating that gives them a nice, glossy sheen. This makes them more attractive on your buffet table, and the special coating makes them easy to clean. Some of their best features include thick foam insulation to hold temperatures in the safe zone for over six hours, much better than our competitor. It's got an easy-to-use latch you can open and close with one hand. Top loaders and end loaders have a built-in seal which means no gaskets to deal with. Let me show you some of the additional features of the end loader and how it stacks up against the competition. First off they have a low profile double hinge that opens fully for easy access. Second, they have wide easy grip side handles for a stable two person lift. End loaders have an amazing dolly - just watch how easy it is to maneuver. Four rotating wheels give this dolly maximum maneuverability. So to recap, Cateraide Its offer beauty and durability. You'll be proud to serve out of them and enjoy their durable, easy-care use when you're transporting food or beverage. This beauty is a beast. Learn about the features and benefits that come with Carlisle's line of Cateraide food and beverage transporters! 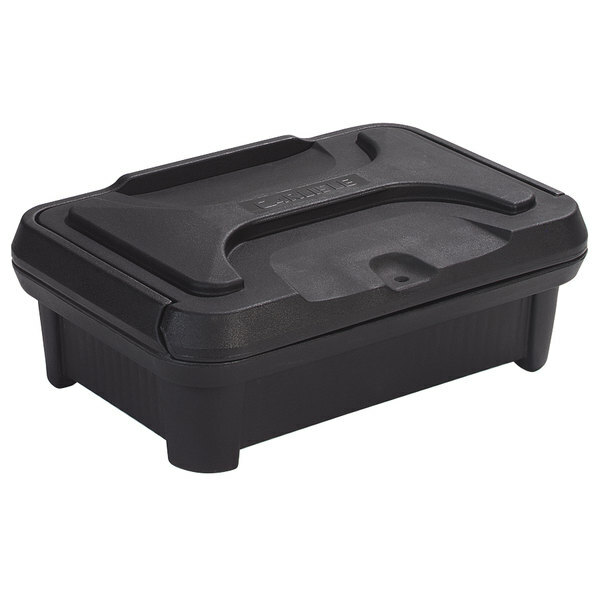 Conveniently hold food temperatures for 4 to 6 hours with this Carlisle XT140003 Cateraide Slide N Seal black insulated food pan carrier and sliding lid set! Its revolutionary sliding door design, combined with thick insulation, holds temperatures longer than any other design, while the self-venting lids keep foods fresher, crisper, and more appetizing. There are no latches, hinges or gaskets to clean, break or wear-out, and no metal parts, making this food pan carrier ideal for almost any facility. 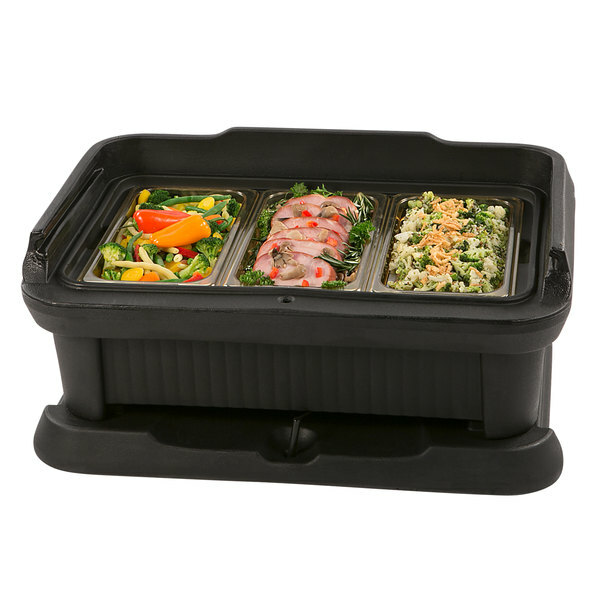 It features convenient molded-in finger notches, allowing you to easily load and unload heavy food pans. The sleek, contemporary appearance is ergonomically designed for easy loading, handling, stacking and storing, and the tough, scratch-resistant polyethylene construction is easy to clean and maintain. 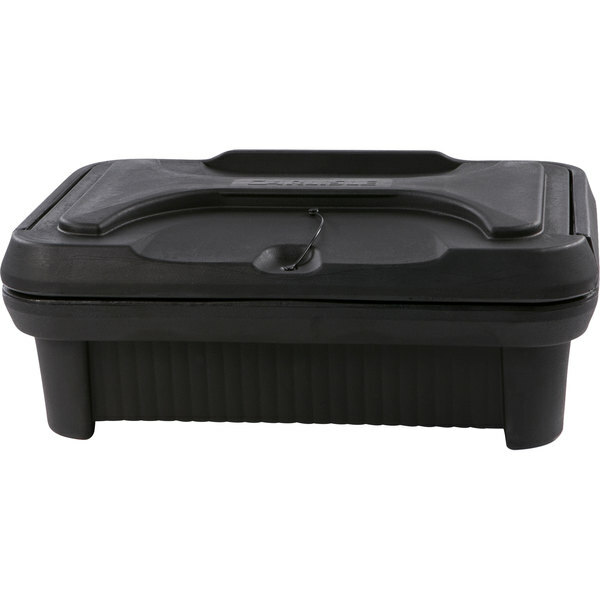 This insulated food pan carrier has a molded-in tag slot that allows the carrier to be sealed with a zip tie for food safety and identification. For added safety during transport, its molded-in tethered lock pin seals the carrier. Each unit comes with 6 zip ties, and it accommodates food pans up to 4" deep. One helpful trick that I do prior to putting hot food in the carrier is I take boiling water and dump it into the carrier and that "preheats" the unit. It will keep the food hot longer. Then I dump the water out and put the food pans in. These are also very easy to clean.